What to do with so many paths open? What do you do about those that have been closed, have become “paths you do not use”? Well, eventually you go down them, equipped with knowledge gained from the last pendulum swing away from those lanes. 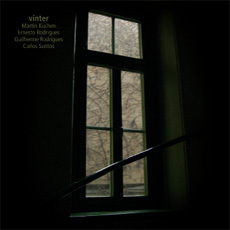 There is a kind of theme that works its way through the improvisations on “Vinter”, supplied by Marten Küchen, a plaintive upward arc on his alto, filled with emotion, yearning, pain, hope. It’s the kind of element that would have been (would still be, often) frowned upon in much music produced post-AMM, occupying the niche known as “eai” where it would have been seen as too manipulative, too referential, too imagistic perhaps. And it may well have been at one time; there was likely a period when it would have been a too-safe fallback position. But time and experience act on things, on people, the pendulum constantly goes back and forth while the entire mechanism moves forward in time and new knowledge and perspective is acquired. It’s more complex than that of course. The musicians here never really operated within the bounds of a set category like electro-acoustic improvisation, as much as their work was informed by it, but skirted its borders, partaking of jazz-based improvisation, folk musics and contemporary “classical” developments in any number of subgenres. So there’s something of a mixture when looked at from one angle: the high-pitched, scraped-sounding strings of Ernesto and Guilherme Rodrigues on the one hand fit into the eai tradition of bowed objects while at the same time swelling into an almost chorale-like mass of support for that keening alto of Küchen’s. Between them, they often resemble wind whistling through cracks in wooden walls. Carlos Santos’ electronics remain largely abstract and often subtly percussive in sound but, too, join forces with the strings in those tidal surges, one of which, near the middle of the second cut, acquires a virtual climactic character. They’re unafraid of allowing a tinge of romanticism, something often looked askance upon if not forbidden, into their music. There’s an arc to the performance as a whole, the final track like an exhalation, the cello sounding low, the alto emitting breathy gasps. “Vinter” chooses a path between paths, acknowledging all sides but opting for an area between, where the leaves are untrodden, where the ground may be thornier but which fits with the essences of the four musicians, unconcerned as to fashion.